which assault should I keep and how many should I have? I've been having a hard time getting good weapons so my assault damage is kind of weak, making them unreliable for getting kills when I really need them. Billy Bob looks like the best one to me, but maybe somebody else who uses that class often can chime in. Assault is my least used class for the reason that you described. I can’t count on them to kill/stun everything in their damage cone. I attribute this to my ignorance of the class though. Assault seems to be very popular with the higher tiered players. I like Tony the best, he has 4 of my favorite traits. I would keep and promote him. Next I would work on Billy-Bob, he is a keeper too. Sally and Denise with bullet dodge are good for outpost and any map with human enemies but that trait is so common, I would ditch both of them and use their tokens instead. You should look this traits for a assault; lucky, dodge, defensive stance, iron skin and bullet dodge or marksman. Ypu can skip marksman because you can put them lethal badge. To me this is a no brainier. Retire Sally and Denise for the tokens. You'll find better along the way if you need bullet dodge but that would be for no more than your third Assaulter. I'd invest those tokens and find Billy Bob's 5th trait first. In order Sure Shot-Ruthless-Revenge would be my preference for his 5th. In fact right now I'm looking for one with Lucky-Dodge-Marksman-Iron Skin-Ruthless but this would be for my 4th Assaulter. To me I prefer Ruthless on my primary Shooter/Hunter/Warrior/Scout classes. If Billy Bob gets Vigilant-Bullet Dodge-Def Stance as the 5th he still has good traits. I wouldn't necessarily scrap him unless you have a better traited option, even if you begin investing in Tony. Tony needs either Dodge-Marksman-Sure Shot to make him a keeper. Thanks for all the great input on the traits! 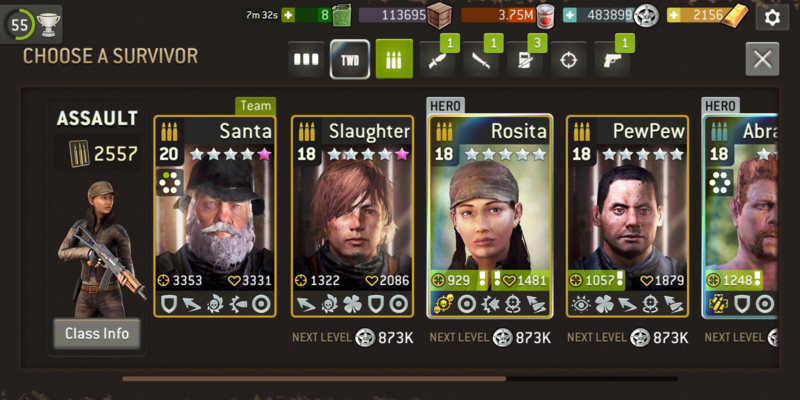 Im hoping i can get more Abraham tokens and make him my primary assault! 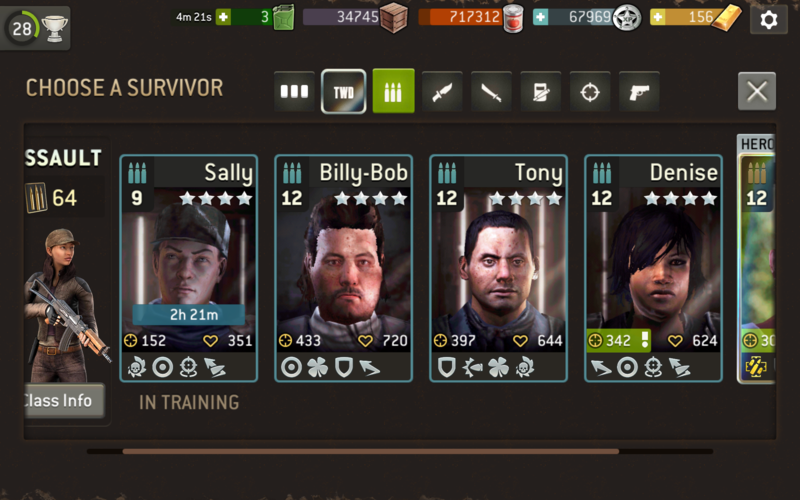 Getting Abe tokens is fine and dandy but if you pull Sure Shot or even Ruthless Billy-Bob will be a better traited survivor than Abe. You'll also be able to get Billy-Bob to pink much faster than you could Abe. There are times when Abe in leader position will be a great value but overall having him as a secondary option is a better strategy, Hope you get a good 5th on Billy-Bob and start advancing him. I just got the 5th star for Billy-Bob and unlocked Sure Shot! So he now has Marksman, Iron Skin, Lucky, Dodge and Sure Shot. Personally, I think ruthless and revenge are wasted traits on assaults. And revenge in general only on a secondary shooter/hunter. I have injured a team-mate by revenging an exploder too many times. The 5th trait you got is excellent. I have that exact same survivor - even the same avatar. A little further along than yours as he has 2 pink stars. Outfitted him with 3 damage reduction badges, a damage increase badge, and 2 health increase badges. With level appropriate gear, he has about 90% kill rate on walkers 4-5 levels above him and can take 2-3 hits from them without bruising. He is a BAD MAN! I hope Billy-Bob can grow up one day to become a bad man too! Billy-Bob and Tony are your best to check 5th traits on.